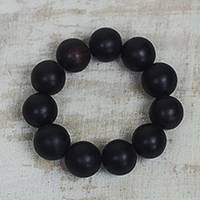 Resembling meditation beads, orbs of ebony wood encircle the wrist. 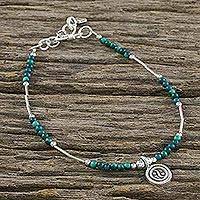 This bohemian beaded stretch bracelet is designed by Ghanaian artisan Robert Lanyo. 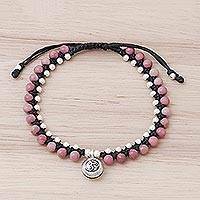 A beaded strand of dyed black onyx and sterling silver graces the wrist. Bali's Nyoman Ariawan designs this beaded bracelet, adding a pendant in the shape of Buddha's head for a meditative accessory.